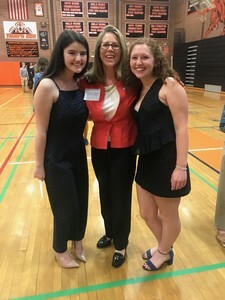 Ms President US has proudly awarded scholarships to two exemplary high school girls who served as Mentors throughout the girls’ civic leadership program: Jennifer Gordon and Erin Hanlon. Both Ms Gordon and Ms Hanlon made a significant contribution to the success of the Ms President US program by consistent and ongoing support of the girls enrolled. Ms Gordon assisted with nearly every session, among the first to arrive and last to leave. Ms Hanlon was not only a Mentor but also a session presenter, representing the Girl Scout Ambassador program during the kick-off session titled, Activate Your Girl Power! Ms Hanlon was active in the Girl Scouts for 13 years, winning the highest honor, Gold Star. Girl Scout members who are enrolled in the program are eligible to earn the Girls in Government badge (Juniors) or the Finding Common Ground badge (Cadettes). A “fun patch” is provided to girls who are not part of Girl Scouts. The mission of Ms President US is to inspire and prepare girls to aim for the highest civic leadership positions and to know that they can achieve them. Sessions are held in Ridgefield on eight Friday afternoons between October and March, culminating in a campaign and election in April. High School girls with leadership experience are encouraged to apply to be Mentors. Visit the Enroll / Mentor page of the website to learn more. Ms President US is a 501(c)(3); a non-partisan, non-profit, community-based initiative dedicated to inspiring and preparing girls to aim for the highest civic leadership positions and know they can achieve them. Contributions to the program are tax-deductible.